Whether you’re thinking about decorating your new place, or just wanting to make your old place seem like new, we have got the tips to help you do both! Get those creative juices flowing, here are some cool interior design hacks that will make your place look like new! Create a photo wall – you might have seen it on a display, or on the internet somewhere. Creating a photo wall is actually a bit easy. All you will need are a few craft items. Use a removable contact paper to plan out the shapes and layout first. You can remove that later once the nails are in. This will save unsightly holes that you might get after you have changed your mind on the layout. Hey, it can happen. Give one of your room (or the whole place!) a new lease of life by painting half of the walls and leaving the upper half a slightly lighter colour. It might seem a bit crazy now, but this makes the room seem taller and lighter. You don’t even have to dress up the room so much then because it is a bit of natural décor. If you are looking to add more height to the wall, add full length curtains. You can thank me later. Try chalkboards! Ever seen those cute chalkboards on neat and cosy restaurants? Or you have probably seen it in a café. 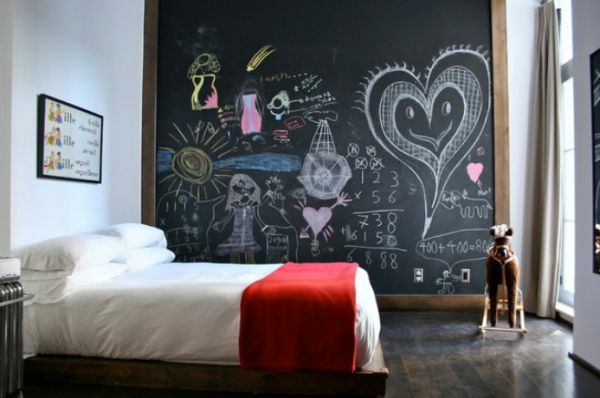 Either way, a chalkboard can definitely bring a new look. You can even go crazy with a chalkboard kitchen wall. You will only need to buy chalkboard paper or paint. Then you can use this on one of your kitchen walls. Be creative, you can use the chalkboard to write dinner plans, recipes, reminders, shopping lists and more. If you have a fireplace that you don’t use, make the most of the space by filling it with candles. Or you can even make a log stock, or a plant. This will make it look sleek, smart and decorative. If you have hydrangeas in your garden, here’s a neat trick. Hydrangeas changes colour, so if you fancy a different outdoor colour scheme, you can add sulphur or acid to the soil. You can pick any colour you want. Get creative. Have a plain crate lying around? Re-purpose it! Give it a paint job and attach it sideways, just off the floor, in your hallway. This will transform it into a handy shoe storage, or a simple side table for your keys, coins, etc. This can also be a great place to store all of your cushion when you are not using it at night. If you are not into wallpapers, you can just use an engraved roller to paint your room! This will give it a nice texture, and a cool, creative design to come with! If you have liked this article, share it with your friends!